A diamond blade for cutting asphalt. The ASX10 is an entry level Asphalt Blade designed to give a good performance for a great price. Perfect for users not cutting on a regular basis or for one off jobs. The ASX90 has been developed to offer a longer cutting life. Designed for users cutting on a more regular basis, or a one off job which lasts more than several cuts. The blade is manufactured using the latest techniques such as undercutting protection and L-Welded segment attachment, this is a premium blade, yet still excellent value for money. 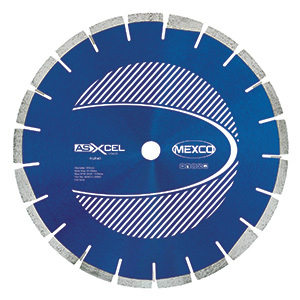 The ASXCEL is a superior diamond cutting blade. Developed to meet the needs of contractors and builders who cut on a regular basis and demand a superior cut everytime.